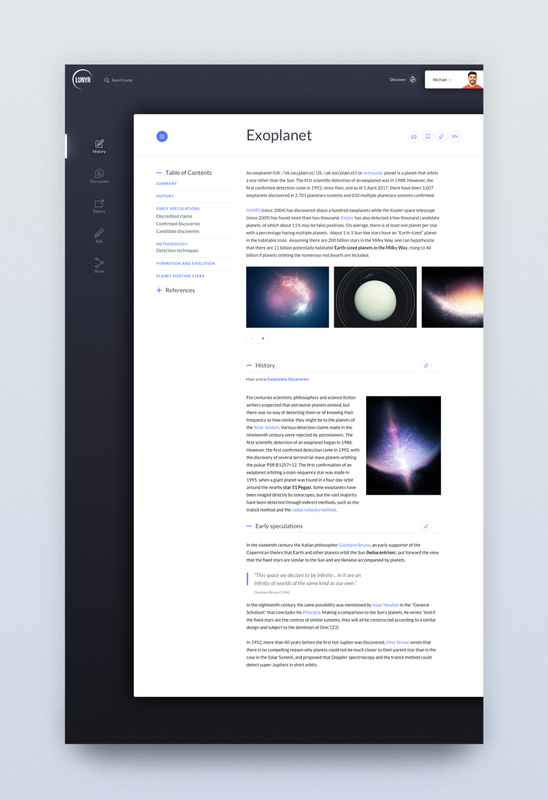 Lunyr is a decentralized crowdsourced encyclopedia which rewards users with app tokens for peer-reviewing and contributing information. It aims to be the starting point of the internet for finding reliable, accurate information. Put simply, Lunyr builds upon the philosophy of Wikipedia and invents a next generation knowledge base on the Ethereum blockchain. accurate information. The long term vision is to develop an API that Artificial Intelligence, Augmented Reality, Virtual Reality, and other software can use to create new applications. The long-term vision of Lunyr is to develop a knowledge base API which developers can use to create next generation decentralized applications in Artificial Intelligence, Virtual Reality, Augmented Reality, and more. The Lunyr API holds promise for significantly changing existing business models and creating new ones.The Ethereum blockchain currently has no knowledge of the real world, yet most useful applications require real world information. Through the Lunyr API, decentralized applications will be able to tap into the knowledge base and grab accurate data on real world events and information. Think of Lunyr as the knowledge layer of Ethereum, driven by consensus and economic incentives, for creating next generation decentralized applications. Information plays a crucial role in our lives and we require it on a daily basis. According to Alexa rankings, seven of the top 10 most globally visited sites are associated with searching and obtaining information. Currently, the world’s most valuable reference site is undisputedly Wikipedia, which many now view as “truth.” But what happens when “truth” is inaccurate but viewed and accepted by billions of people? On Wikipedia, many articles can be edited by anyone with an internet connection. Users can easily falsify information. Although popular articles with inaccuracies are likely to be quickly corrected, less popular articles can go uncorrected for months. For example, John Seigenthaler, a former assistant to U.S. Senator Robert Kennedy, was falsely implicated in the assassinations of the Kennedy brothers on his Wikipedia biography for over four months. Of course, this is only one among the many examples of libel, hoaxes, and vandalism in Wikipedia’s history. Enter Ethereum, a decentralized platform for applications that runs exactly as programmed without any chance of fraud, censorship or third-party interference. 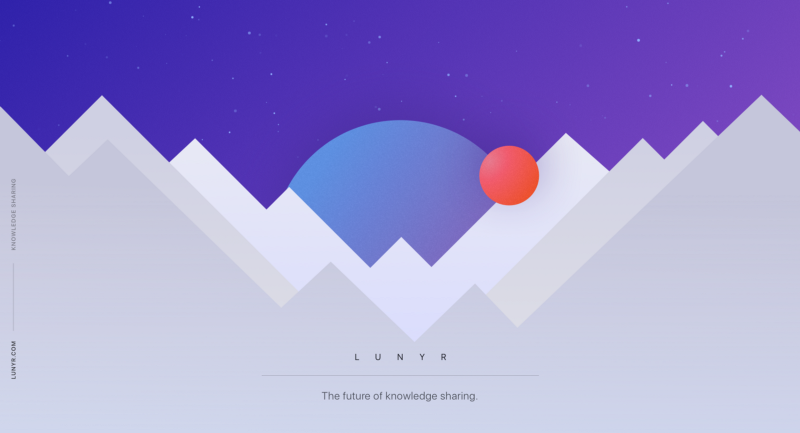 Using Ethereum, Lunyr creates a next generation knowledge base that solves the problem of inaccurate information and pushes the boundaries of knowledge bases. Ethereum enables the creation of app tokens, which can be used in an incentive system to replace intermediaries. In Lunyr’s system, tokens play a key role in providing incentives so that the rational behavior of individuals results in common good. All content submissions go through a mandatory peer review process and are not committed to the knowledge base until validated for reliability and accuracy. A powerful incentive system enabled by app tokens ensures that peer reviewers act in the best interest of the ecosystem. The end result? Highly accurate and reliable information. Rewarded contributors. A wellspring of reliable information for creating next generation decentralized applications. Claim LUN and HNR tokens from smart contracts. Use LUN to advertise. Use HNR to resolve disputes and quality issues. With the completion of our platform design and plans for an invitation-only alpha, we are excited to announce a token crowdsale for Lunyr on March 29, 2017 at 16:00 UTC. Lunyr is an Ethereum-based decentralized crowdsourced encyclopedia which rewards users with app tokens for peer-reviewing and contributing information. It aims to be the starting point of the internet for finding reliable, accurate information. The long-term vision is to develop a knowledge base API that Artificial Intelligence, Virtual Reality, Augmented Reality and other software can use to create next generation decentralized applications. The platform itself is designed to encourage the continuous growth of highly accurate and reliable content. A powerful token incentive system aligns individuals and drives content creation and review. In 2006, Jason Calcanis, the cofounder of Weblogs, Inc, which was acquired by AOL, published an article about Wikipedia estimating an annual advertising revenue potential of $100MM. In 2008, BusinessInsider.com performed an analysis of Wikipedia and arrived at an annual advertising revenue potential of $350MM. In 2011, Vincent Juhel published a thesis about Wikipedia for HEC Paris, and arrived at an annual advertising revenue potential of $1.6 billion dollars. The crowdsale period will occur March 29 to April 26. The exact start and end block numbers and LUN contract address will be announced on our community channels. Instructions to participate will be posted on the Lunyr website. Note: We may change the crowdsale targets and LUN purchased per Ether anytime before the crowdsale begins if sudden and significant ETH price movements occur. LUN is not equity and does not grant any right to participate in the control, direction or decision­ making of Lunyr or the Lunyr application. Arnold cofounded Leandigest Inc., a Silicon Valley-based tech startup, as CEO. He started programming in C++ at the age of eight, and later on, was an evangelist of BitTorrent and Bitcoin. As an Ethereum activist, he organizes Ethereum Developers Community, the second largest Ethereum meetup in Silicon Valley, where he also teaches decentralized application development. He graduated from University of California, Los Angeles and University of Pennsylvania. Andrew cofounded Leandigest Inc. as COO. Prior to that, he had built an insurance business with over $10MM in sales. Before entrepreneurship, Andrew worked as a Project Manager, and later, Account Executive at Oracle where he closed the largest ever hardware deal for their small-medium business division. He holds a B.S. in Computer Science from University of California, Los Angeles and an MBA from University of California, Davis. Ben is a veteran Bitcoin blockchain developer. He cofounded a technology-driven marketplace called Evlo as CTO. His previous work includes developing data models and researching Machine Learning, Natural Language Processing, and Artificial Intelligence for business applications. He holds a Masters of Science in Electrical and Computer Engineering from Carnegie Mellon University. Christopher was the Cofounder CTO of BitMesh, a decentralized platform that enables users to share their internet connections. He has developed algorithms for Internet of Things and Deep Learning applications. Christopher possesses over seven years of experience as a software engineer. He was a PhD candidate in Computer Science at University of California, Santa Cruz and holds an M.S. and B.S. in Mathematics and Computer Science. Steve specializes in graphics design and front end development. He designed the UI and UX of Ethboards, a decentralized job board concept built on Ethereum for recruiting and connecting developers. He graduated from University of California, Berkeley with a B.A. in Political Economics and emphasis on International Trade. Holly provides marketing expertise. She has been developing marketing strategies at Stanford University since 2013. Her prior work consists of creative writing, videography, and art, for which she has received Congressional recognition. She will be graduating from Stanford University this year with a Bachelor’s degree in Psychology and a Minor in Creative Writing. 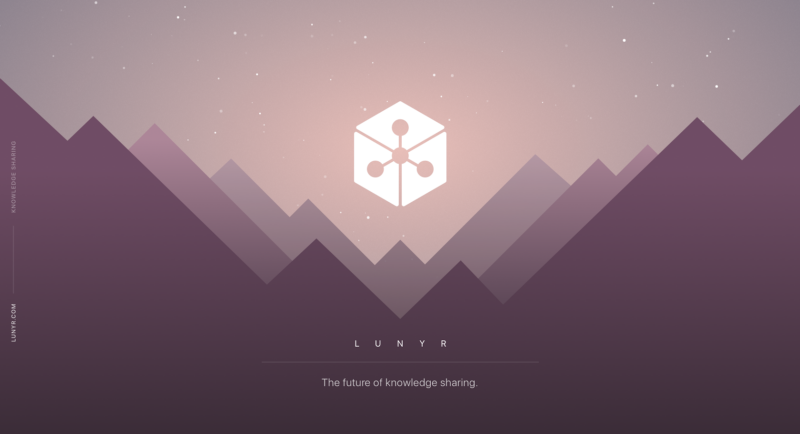 Lunyr was built on the principles of collaboration and community support. We would like to continue the collaborative spirit by presenting a bounty program for supporters to earn LUN. To earn LUN, simply accumulate points by the end of the LUN crowdsale. At the end of the crowdsale, points for each category will be added up and used to calculate the number of LUN you will receive. 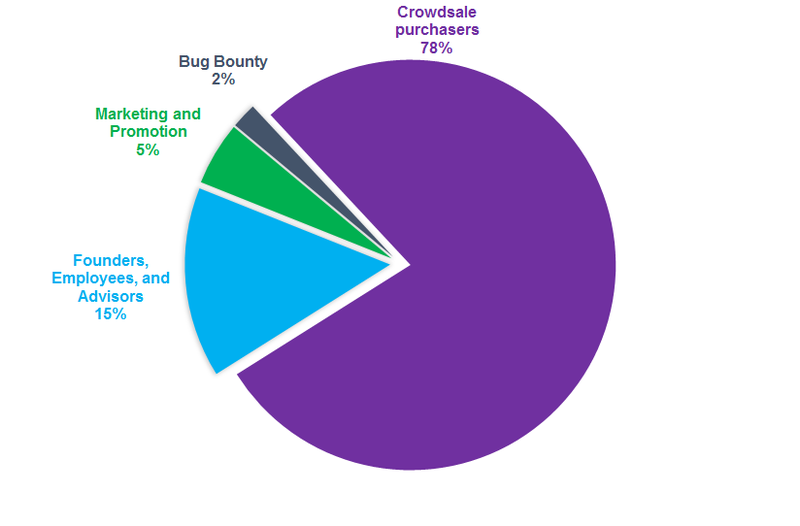 The number of LUN you will receive for a particular bounty category is proportional to the number of points you’ve earned in that category. Then you will earn 3,000 * 1 / 200 = 15 LUN. 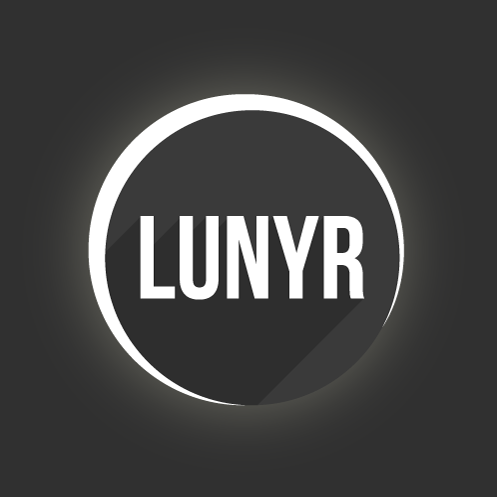 Subscribe to our newsletter to receive news about Lunyr’s development and related information. Visithttps://newsletter.lunyr.com/ and submit your email address to earn LUN. No spam, ever. Your email address will only be used for Lunyr’s newsletters. Each valid email address receives 1 point. Don’t miss out on the biggest pool of LUN rewards. Add our official signatures and avatar to your Bitcointalk profile to earn LUN. c) Participant needs to post more than 15 quality posts per week including at least 2 messages on the Lunyr crowdsale ANN Thread to qualify for the weekly points below. Spam or low quality posts that are removed by administrators will not count. Help spread the word about Lunyr to your community. Earn LUN by translating our white paper and Bitcointalk OP to another language and moderating the thread conversation. Write blog posts about Lunyr to earn LUN. Topics can include, but not limited to, the crowdsale and future applications of Lunyr. We will frequently tweet updates and announcements from @LunyrInc. Make sure to follow us on Twitter and retweet to earn more LUN. Subscribe to our newsletter to receive news about Lunyr’s development and related information. Visit https://newsletter.lunyr.com/ and submit your email address to earn LUN. No spam, ever. Your email address will only be used for Lunyr’s newsletters. Each valid email address receives 1 point per week. Nefarious entities are trying to manipulate you! Let’s address a common question that’s central to the success of Lunyr. 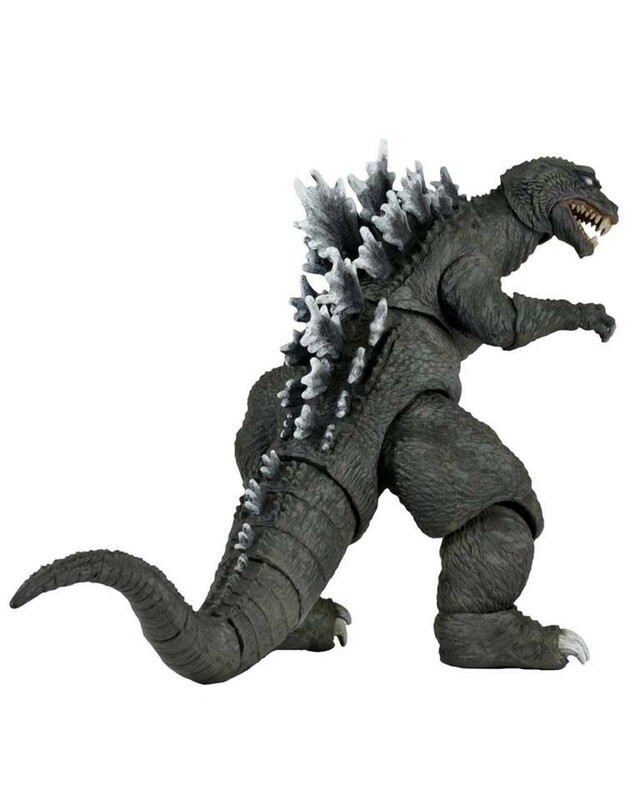 Understandably, many worry that advertisers, political groups, large companies, and even Godzilla will seek to to control their public image by manipulating the Lunyr platform. While no good protection exists against an attacker with unlimited resources, we can mitigate the efforts of all other attackers. The basic idea is that even if every user is trying to manipulate the information, they aren’t all trying to manipulate it in the same way, so we can play them against each other and they will cancel each other out. We model an attacker as a well-funded entity that wishes to bypass peer-review in order to misinform readers. If you’ve spent any time around the internet, you’re probably familiar with the notion of a paid shill or a sock puppet. That’s what we are talking about here. There are other attack scenarios, but we will address this one first. To prevent such attacks, we make the cost of an attack increase with the size of the attack. In total, we have five layers of defense. These tasks are difficult for bots, but straightforward for humans to do. It just takes time and money. Some of you might know about stack smashing. It’s a technique of exploiting software by overwriting the return address on a stack frame in order to redirect the flow of computation into malicious code. One technique to mitigate this is called Address Space Layout Randomization. This isn’t a silver bullet (no such thing), but it definitely makes it harder to hack things. I bring this up because it’s a good analogy to what we do with peer-reviewer selection. When somebody submits a contribution, we measure it against the contributions of all the other peers and select a set of ~100 candidates whose contributions are most similar to the one being reviewed. From there, we randomly select the 5 peer reviewers. There are “100 choose 5” or 75287520 possible ways to choose 5 peer reviewers from a pool of 100, so if an attacker manages to get 10 accounts into that pool, the probability of the attacker getting all 5 reviewer spots is “10 choose 5” divided by the total number of ways to do it is equal to 252 / 75287520 or .000003347… An attacker would have to control 88 of the 100 closest peers in order to have a greater than 50% chance of having total control of the review process for that piece of content. An attacker might be able to do some damage by only controlling say 2 of the reviewers. It would only take 32 attackers in the pool to reach a 50% probability of having at least 2 attackers in review. If we increase the size of the pool, the number of attackers required for this threshold increases linearly, so for a pool of 1000, it would require 314 attackers in the pool to have a 50% chance of controlling at least 2 of the peer reviewers. Pretty sweet! Check out the script where I got these numbershere. This bush is not immortal. The above analysis assumes that all subsets of reviewers are equally likely and we all know the only uniform distributions are the dead ones. Can we do better by skewing the probability distribution against the attackers? It is a well studied fact that people are not great at talking differently when they are trying to create multiple identities, so if we make a parameter called, say, breadth and we basically say that the distance between each pair of reviewer-vectors chosen from the pool has to be above our breadth parameter, then we can require attackers to create accounts that simultaneously are experts in a given topic and also other topics, making their vectors diverge slightly. By raising this breadth parameter, we can make this requirement as strict as we want, until the pool no longer satisfies the constraint, at which point we can just increase the pool size. This is probably a good idea to do regardless, to avoid having an echo-chamber-confirmation-bias effect. Having a reasonable breadth parameter will make it likely that the content is reviewed by people from various backgrounds, encouraging connectivity in the Lunyr mind-sphere. We give a slight economic incentive for users to post all their contributions from one account by making the reward function slightly convex. This is a pretty big difference, and we can tune the difference by taking the log in different bases. A necessary side effect of this convexity is that your 5th quality point will necessarily payout more than the 4th one. This introduces something of a seniority effect, but it only lasts until the end of the reward period, so it’s not a very strong effect. In general, we want to avoid the early-adopters-take-all patriarchal approach to the reward structure. However, for certain things like reputation, it really helps to have a long memory. For this reason, the payout has a short memory (your CBN are only good for one reward period, and then they are forgotten), and the peer review structure has a long memory (your contributions are remembered longer for the purposes of eligibility and relevance). Your HNR will last for a year or until you spend them on dispute and resolution. The point of this defense layer is that attackers will have to give up LUN in order to attack, in addition to making the tokens less valuable by attacking. Another similar effect is that putting all of your submissions in one account makes your relevance vectors more accurate, so that you are selected to review topics that are more relevant to you. This is a minor incentive. We require that contributors submit content if they would like to be peer reviewers, since you can only peer review if you have contributed something accepted as valuable. So for example, for every one submission you make, you may not peer review more than six submissions. This adds maintenance costs to anybody using a bunch of sock-puppets to increase their reviewing ability. How do we know Lunyr can’t game the system? While we wait for the appropriate technologies that will enable full decentralization, Lunyr is a hybrid system, with part of the code running on the Ethereum blockchain and part of it running off-chain. Because of this, some of the code will have a higher degree of transparency than other parts. Anything that touches machine learning will be too gas intensive to put on-chain, so one might argue that Lunyr could rig the model to pick certain peers for certain topics. This will be difficult for Lunyr to do without getting caught because all of the code, models, and peer history will be open source, including the random seeds. (User information will not have personal identities in it.) We will put the models and data on IPFS, so that anybody can download them, run them against our public data and come up with the same answers. In case someone worries that we searched through random seeds until we found a good one, we can base it off of the hash of the latest Ethereum block header. Thus gaming the seed would require us to be able to influence miners in some way that is likely unprofitable for them, since they normally choose the first nonce that is valid. What if people try to sell their accounts? CBN and HNR are not transferable. While CBN being transferable would not make much of a difference, since the LUN they translate to are transferable, we refrain from making CBN transferable for the sake of simplicity. HNR are not transferable to discourage selling HNR, although in practice it’s very difficult to prevent people from selling something they own when there’s a demand for it. The important thing is that HNR does not allow you to edit content, so accumulating HNR illicitly or otherwise does not give someone the ability to bypass the peer review system. What if users re-submit the same content multiple times? We can limit the rate of user submissions based on the similarity to and quality of previous submissions. Higher quality, different submissions are prioritized in peer review relative to lower quality or rejected submissions. We will also have a limit on the number of un-reviewed submissions per user at a given time, to mitigate denial-of-service attacks. How will we know if a Sybil attacks has occurred? The dispute and resolution process will have an option to report bias, which might indicate a Sybil attack. This way the community can be self monitoring. If Sybil attacks prove to be a persistent problem, we can adjust various parameters in our defense layers to increase the difficulty. We would like to announce that we are updating the crowdsale numbers to reflect the recent increase in the price of ETH. We have seen many exciting events since the publication of the Lunyr White Paper. The old numbers are now out-of-date. Please check below for our updated crowdsale details. We have updated the White Paper to reflect these changes. We are pleased to announce that theLunyr crowdsale contracts audit byMikko Ohtamaa (CTO of TokenMarket.net) has passed with all green lights. We wanted to share our knowledge of dapp development with developers who were struggling with finding good learning materials. We wanted to build a stronger Ethereum community in Silicon Valley. Through connecting developers and providing them with the resources to achieve their goals, we have grown Ethereum Developers Community into the second largest Ethereum meetup in Silicon Valley. On March 23rd, Arnold and I presented the Lunyr project along with information about the upcoming token crowdsale (March 29, 2017 at 16:00 UTC) to Ethereum Developers Community. We would like to thank the community for its feedback and support. For those who couldn’t attend, here’s the YouTube video. 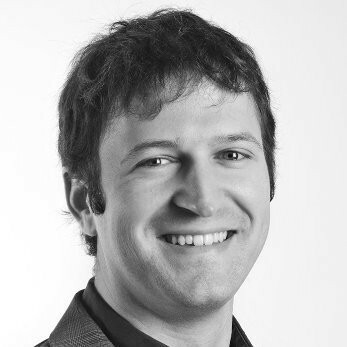 We are excited to announce that Alex Leverington has joined the team as Technical Advisor. Welcome to the team Alex! Alex has been involved with Ethereum as a core developer since the very beginning. He worked at ETHDEV, where he architected and programmed devp2p, Ethereum’s underlying P2P protocol layer. Alex has also made key contributions in Ethereum encryption and security, primarily touching the various communications protocols. He remains active in the protocol steering group. Time is moving forward and so is the progress on Lunyr’s components. Today we’ll take a closer look at the Lunyr advertising system. The Lunyr ad system uses powerful technologies like IPFS and Deep Learning. Like BitTorrent, IPFS uses a Distributed Hash Table as the underlying technology for decentralized data storage. Deep Learning is a branch of machine learning that uses neural networks with multiple layers (like your neocortex) to learn hierarchical representations of data. You can do lots of cool stuff with deep learning, from image recognition, to simulating hallucinations, to magically applying an art style from a painting onto your photos. See this video for a presentation on some of the more philosophical aspects of neural networks. What does it look like behind-the-scenes when advertisers participate? B is the maximum amount they’d bid, in LUN per 1000 impressions. Using our word embedding model, we can associate each document (collection of words) with a vector whose distance from other document-vectors represents its semantic similarity to those documents, so we can define a function relevance(doc1, doc2) that returns a number indicating the relevance. We can use this function on A concatenated with K (A | K) and each web page to get a relevance score. We then combine this relevance score with B to determine the rank of the ad. Impression price = the amount your nearest lower competitor pays / your quality score) + a small number. How do we update content? When anybody requests our node’s id, IPFS will automatically search for the content hash associated with that name that has the largest sequence number (i.e. the latest). What is word embedding and why do we want to use it? The idea behind word embedding is that words that are used in similar contexts probably have similar meaning, so if we train a neural network to recognize when words are in context and out of context, then that network will encode a lot of semantic information. The reason this works is that the notion of context is really flexible, and simply represents what the geometry of the media-vector-space *should* look like locally. So if we have known matches of context (via peer review), and it includes images relating to text, then we could train another neural network to associate vectors with images that are close to the word vectors for words that are in context and far from word vectors that are out of context. We can do this with any media. We can even do it with other languages by taking known pairs of synonymous words and treating that as the notion of in-context. In a nutshell, this technique is both state-of-the-art and very flexible. It was developed at Google as a marriage of old Natural Language Processing (NLP) ideas with new neural network ideas. It has been demonstrated that the word embedding technique doc2vec does very well on identifying duplicate questions in Q&A forums. This is essentially what we want to do: determine the similarity between bodies of text. How do we use word embeddings? We have a database of each document, its IPFS hash, its last hash (documents are edited), its latest vector, and the model version that produced the vector (the model may be retrained). Additionally, we have an R-tree (or something like it), which is a way of storing a large number of vectors in a hierarchy of rectangles in such a way that it makes it fast to look up the nearest neighbors to a given vector. We compute the vector corresponding to the text ad, and then use the R-tree to look up the nearest N neighbors to that vector. We then look up the document hashes corresponding to those vectors in the database. This gives us a list of the N most relevant pages for that ad, which we can sort by distance from the ad vector. The quality of an (ad, document) pair is essentially how close together their vectors are in this vector space. This then gets combined with the bid amount for that ad and the bids for other nearby ads to determine the ad-rank. We store the word embedding model on IPFS so anyone who wants to audit the process may do so. We periodically recompute the vectors for the documents to account for changing content. How do the ads get served? What is the Ad Repository? What is the Ad Performance Module? The ad performance module records impressions and clicks for every ad, so that advertisers can view the performance of their ads. What is the Ad Auction? This is the engine that determines ad rank, so it interfaces with IPFS and can view the ads and bids that advertisers submit. What is the LUN Pool? The LUN Pool stores all the LUN that advertisers pay, along with newly created LUN. 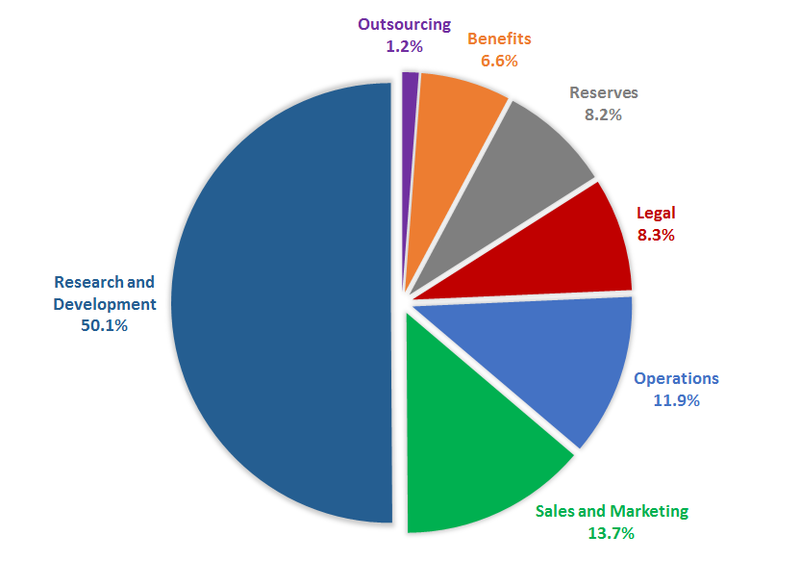 These tokens are distributed at the end of every pay period to Lunyr and the contributors in proportion to the CBN they earn. The overall system design will be revealed soon. Stay tuned for more details. Today let’s take a closer look at Lunyr Tokens (LUN) and see where they get their value. First off, LUN are used for advertising on the Lunyr platform. Contributors obtain them by creating and peer reviewing content. LUN are valuable for businesses. Since the content on the knowledge base covers a range of topics, the LUN have general-purpose utility for businesses to advertise on the platform. Businesses are in a great position to buy LUN because they’re more likely than consumers to hold plenty of disposable resources to compete in bidding wars and drive up the demand for LUN. The value of LUN correlates well with the growth of the knowledge base. As the knowledge base grows in the beginning, it eventually reaches a crossover point where the demand for advertising exceeds the supply. 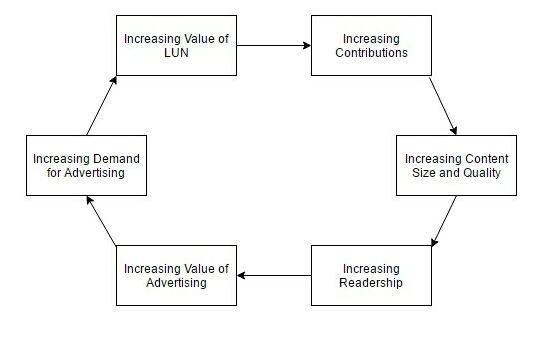 The demand for advertising drives up the value for LUN. Then, seeing the economic opportunity, more contributors enter the ecosystem and add and review content which attracts more readers. Powerful network effects take over and rapidly increase the value of the ecosystem along with the value of LUN. Because contributors are rewarded for their efforts, we reach the crossover point quickly. The value of the ecosystem and LUN does not stop at the knowledge base. Lunyr has a longer term vision to create a knowledge base API, ultimately driving up the value of the ecosystem. In the future, Lunyr may also create other products and services, some of which may increase the demand of LUN. Will the newly created LUN decrease the value of LUN? On the contrary, it actually makes LUN more valuable in the long run. One viewpoint is that creating LUN causes the LUN value to decrease. 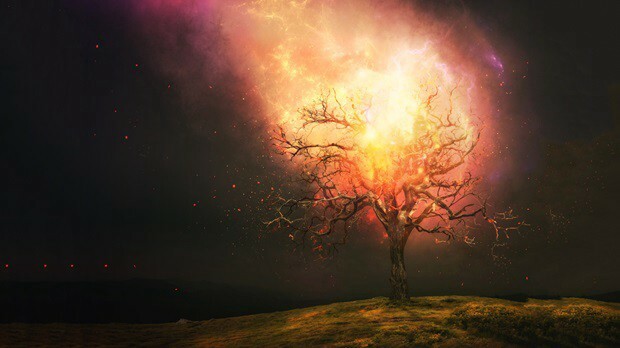 However, this view forgets to take into account that each time new LUN are rewarded to contributors, more valuable content exists and the value of the ecosystem grows. So what actually occurs is these newly created tokens put a downward pressure on the value, but also fuels content creation, which creates a long term upward pressure. The creation of new tokens will also not occur until the Mainnet release. It’s also important to realize that the effective inflation decreases from 3% towards 0% over time. New LUN are created annually at a fixed rate of 3% of the initial token supply. For example, if the initial token supply is 1,000,000 LUN, then 30,000 LUN are created annually. In the first year, the inflation is 3.0%, but in the second year it’s 2.9%, and so on towards 0%. There’s also the loss of LUN from losing private keys, forgetting passwords, and accidentally sending LUN to an unowned account. The loss of LUN grows with the size of the ecosystem. The LUN issuance model was primarily designed to help us overcome the chicken and egg problem. Contributors won’t join the network unless the rewards are valuable, readers won’t join unless they can find valuable content, and advertisers won’t buy ads unless advertising is valuable enough. Sounds like headache right? Thankfully, there’s an elegant solution. If we look at the problem, we can see that the limiting factor comes down to the amount of valuable content to readers. Once we establish a sufficient amount of content contributions, readership will continue to grow until network effects take over. Eventually the LUN from advertising component of the LUN pool should be sufficient on its own to grow the ecosystem. Overall, the ecosystem was designed to grow value in the long term. The knowledge base is a collaborative effort, and by joining its ecosystem now you can take part in bringing tremendous value to the global community. To purchase LUN through the Lunyr crowdsale, see here. We’d like to announce that Lunyr has teamed up with Airbitz to increase the adoption and usability of the Lunyr platform. This partnership represents a major step forward for our vision of creating a next generation world knowledge base that anyone can access. The user experience of managing private keys in Ethereum makes it difficult for a mainstream audience to adopt the platform. To solve this problem, we’ve teamed up with Airbitz, which has been working on a decentralized, secure, peer-to-peer synchronized, cryptographic key management system since 2014. With Airbitz, Lunyr users will have the ability to login and manage their accounts through a traditional username and password experience while maintaining a high level of cryptographic security. Users remain in full control of their private keys. With this partnership, Lunyr strives to become more easily adopted by a mainstream audience. To learn more about the Lunyr crowdsale, see here. We’ve been hard at work creating the user interface for the Lunyr Invitation-only Alpha Release. The major design goal was to create something modern, intuitive, and focused. After much research and going through multiple iterations we’re ready to show a preview. 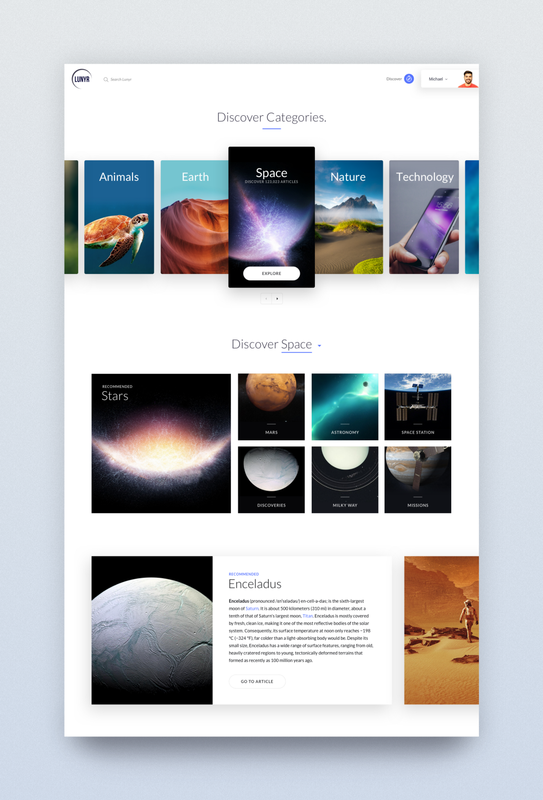 Beautiful, rich layout creates a visually immersive experience as you explore your interests. 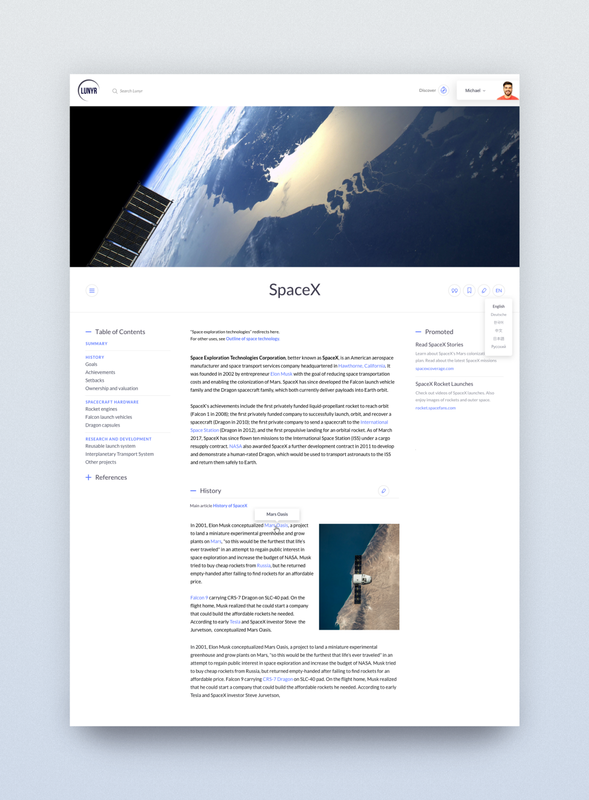 Clean and modern UI focused on content. Collapsible sections. Reading experience feels as comfortable and enjoyable as reading pages from a book. Eliminate clutter with a Show/Hide Citations option (Every bit of information needs to be cited in Lunyr. This ends up looking really cluttered when you see … on every sentence). Article Menu provides intuitive features. 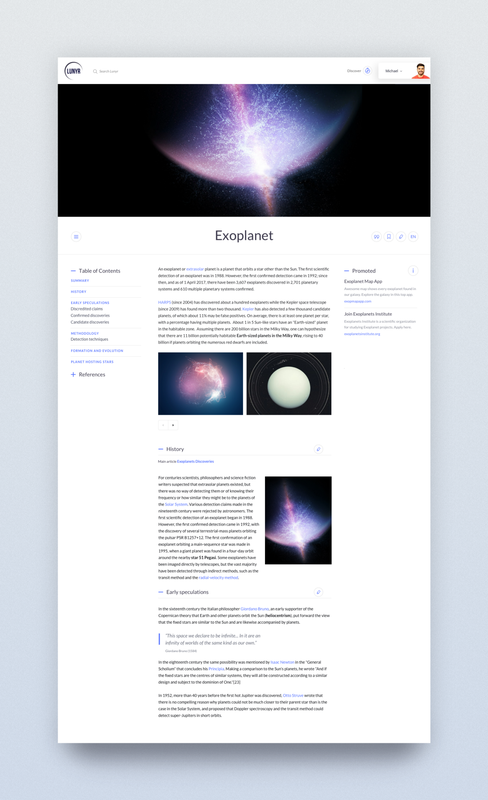 Easy-to-use, simple, drag and drop Editor for submitting content to the Peer Review system. Convenient pop-up menu for citing sources and writing comments for peer reviewers. Automatically saves your drafts. All of this work is ongoing and will become more polished over time. We’re steadily making progress towards the Invitation-only Alpha release. We hope you enjoyed our work so far. Thanks for reading! If you’d like to support the project then please join the crowdsale here. Lunyr Crowdsale successfully surpassed the minimum. Join now before it’s too late! We’re excited to announce that the Lunyr Crowdsale successfully surpassed the minimum today. Over the past several months we’ve received enormous support from our community, partners, and everyone involved. We’d like to thank you all and say that we will continue striving to make Lunyr an incredible success. The design and development of the Lunyr invitation-only Alpha is already underway and we have more goodies to show until it’s ready for release. Thank you all for your continued support. The crowdsale is still ongoing and will not end until block number 3,613,560. You can still join before it’s too late! Join the crowdsale by following the instructions here. Type in the recipient address and amount of LUN you wish to transfer. Click SEND and submit the transaction. 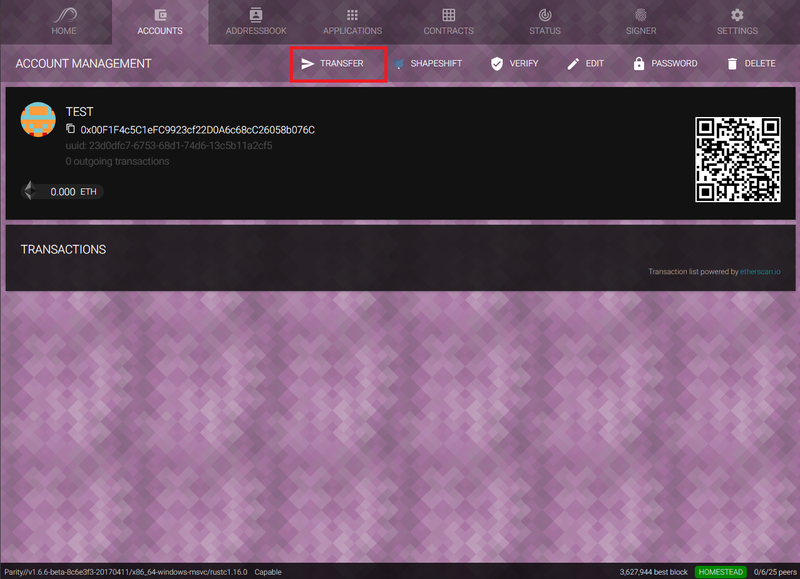 Then click “Send Ether & Tokens” and select your Keystore file. Type in your password and confirm. 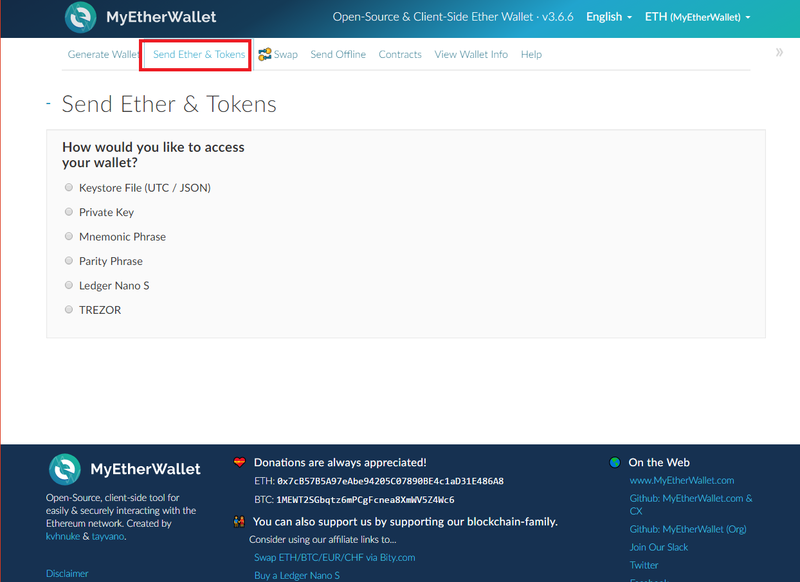 Click on ETH next to “Amount to Send” and select LUN. 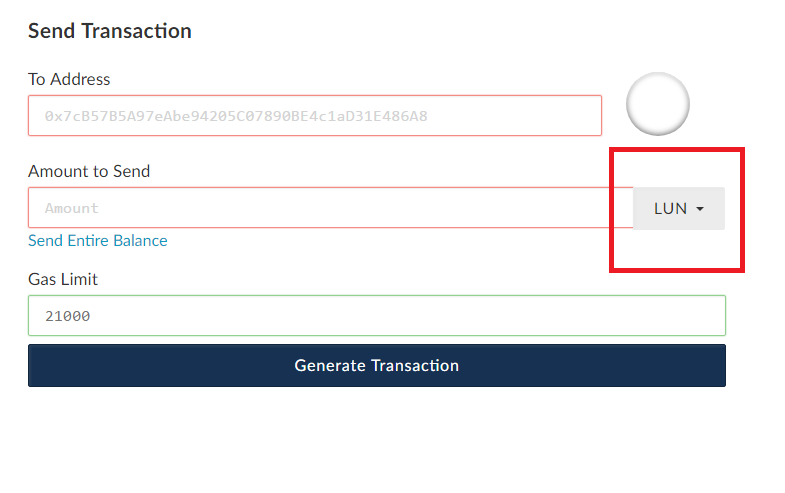 Type in how many LUN you wish to transfer and confirm the transaction. In Mist, select CONTRACTS as shown in the red box below. Under CONTRACTS, scroll down to the bottom. Click on WATCH TOKEN. An ADD TOKEN window will pop up. The rest of the fields will be automatically populated as seen below. You will see your LUN balance under LUNYR TOKEN. Click SEND on top. Select FEE and make sure you have enough ETH to pay for it. 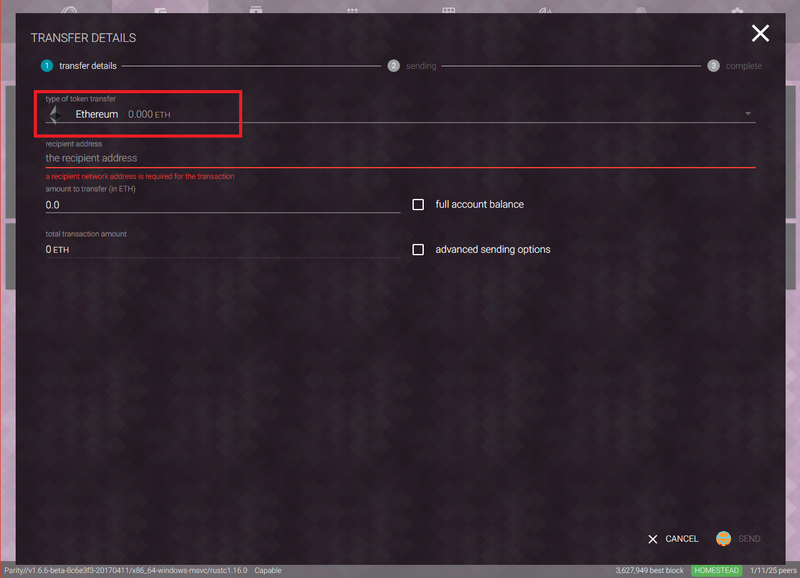 In the screenshot below, the FEE is 0.00075228 and the ETH balance is 0.003 ETH, which is sufficient. Scroll down to click SEND. The Execute Contract window will pop up. Enter password for the FROM account, then click SEND TRANSACTION. Greetings Lunyrians! A lot of time has passed since the crowdsale and we’ve made tremendous progress together since then. Today, we’d like to give an update on the project’s status and reward everyone for being patient. The development of the project’s invitation-only Alpha is looking phenomenal. We’ve refined the technical architecture and drafted the core contracts, which are going through testing and revision as we speak. We’ve devised an innovative method for the community to organize the content autonomously, have made a lot of progress building the plumbing and have been connecting the components of the system. Overall, all the pieces are starting to fit together nicely. Although we’ve been moving fast, we’ve been strict on keeping our standards and the project quality high, and therefore the Alpha will be slightly delayed. Rest assured, speed remains a top priority. Our team has increased in size and we’ve recruited top talent in design, development, and marketing. We’d like to announce Christopher Smith as our CTO. A major goal for us moving forward is having stronger communication and community engagement. Brandon Kelly will be helping us with engaging the community for the next couple weeks. Finally, Lunyr has gone through a rebrand. Below are wallpapers we would like to give the community. Greetings everyone! It’s time for a quick update on Lunyr’s roadmap. As described in the previous announcement, the Invitation-only Alpha release will be on the Ethereum Mainnet. 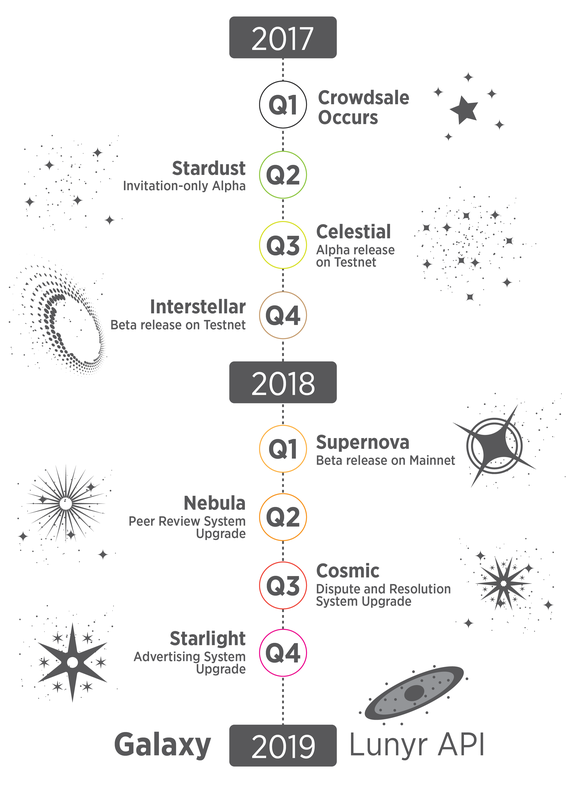 This decision has led to major improvements in the expected delivery time of various features and also means the current milestone has accelerated from the Stardust release to the Celestial release. 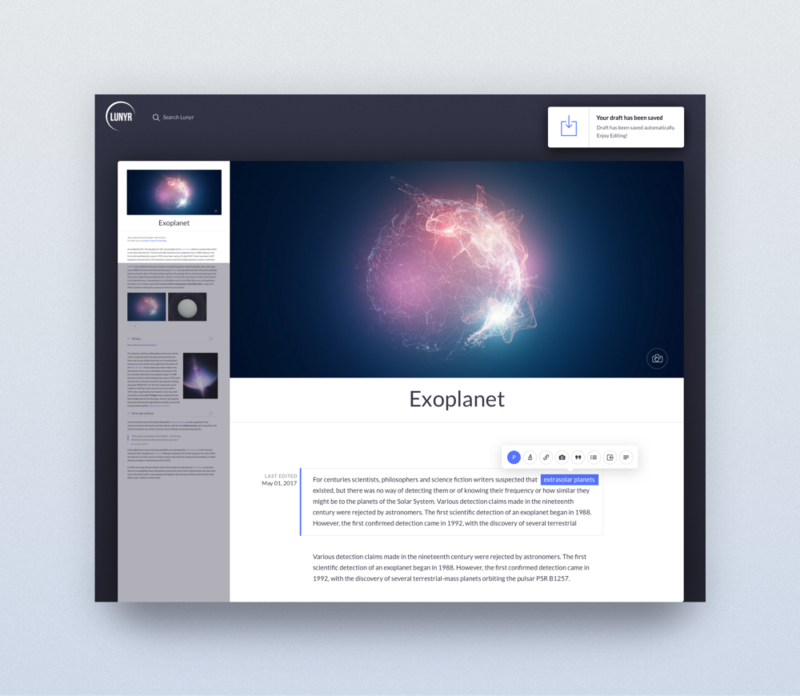 The Celestial release will feature the Content submission system v1.0, Peer review system v1.0, full WYSIWYG editor, Article Discovery, and HNR rewards. Users will be able to accumulate HNR rewards, which will have much more functionality later. We plan on implementing CBN rewards in the Interstellar release so that users will be able to earn CBN; however, LUN distribution rewards will not be available until later testing stages. The Celestial release is coming soon and we would like to invite community members to sign up for testing and providing feedback. If selected, you’ll receive an email with further instructions. Please note that there are a limited number of seats and the sooner you sign up the more likely you’ll be able to participate as an Invitation-only Alpha tester. Please follow the link here and fill out as much as possible.